As well as being great fun and hugely rewarding, dancing has significant health benefits, not least for your lower limbs. Dance regularly and you’re likely to find that your muscle tone, strength, suppleness, gait speed (i.e. the time it takes you to walk a specific distance), balance and coordination all improve. No wonder dancing has the feel-good factor! But whether you’re a rising star in West End musicals or simply taking tango classes in your spare time, dancing will increase your risk of foot problems. This is especially true of the most high-impact, challenging styles, including ballet, jive, salsa, tap and quickstep. That’s why it’s vital for both amateur and professional dancers to learn how to take care of their feet, the instruments of their craft. 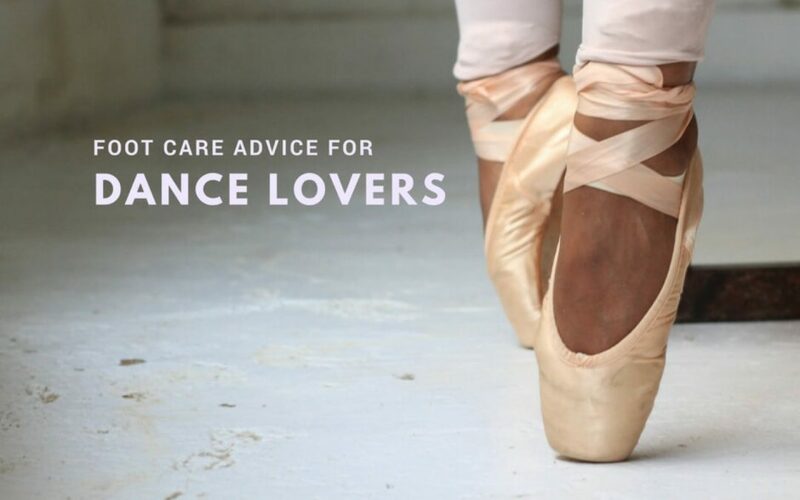 Here’s our top foot care advice for dance lovers. Knowing what to watch out for can help you to spot and seek treatment for dance-related foot problems sooner rather than later. Calluses and corns appear in response to pressure and friction. Agonising corns between toes are particularly common among dancers. Blisters and sores can be caused by unforgiving dance shoes and may lead to infections. Floor burns and splinters are likely if you dance barefoot. Athlete’s foot is an itchy, irritating condition, and the fungi responsible for it thrive in the warm, damp environment provided by sweaty dance shoes. Ingrown toenails and bruised nail beds are associated with ballerinas dancing ‘en pointe’. The extreme pressure exerted on the toes can cause deformities and injuries. Bunions, which are linked to tight, high-heeled shoes such as those worn for ballroom dancing, are painful, bony lumps that stop big toes lying straight. Foot pain in the heels (called plantar fasciitis), balls of the feet (metatarsalgia) and big toes (hallux rigidus) results from wear-and-tear on muscles, joints and tissues. Thankfully, there are several practical steps you can take to help keep your feet comfortable. Establish an effective foot care routine to feel better and dance better! Great foot care for dancers starts with paying close attention to the condition of your feet. Get into the habit of examining your skin and toenails every day. Can you see signs of injury, swelling or infection? Are there any painful areas or changes to the shape of your feet? If you notice something is wrong, see a podiatrist swiftly to nip the problem in the bud. Put plasters, dressings and antiseptic in the bag you take to dance classes. If you get a blister or graze, for instance, you’ll be able to deal with the issue straight away. If you dance frequently, it’s worth alternating between two pairs of dance shoes so that each pair has time to dry out thoroughly. Always cut toenails straight across – giving them curved edges disturbs their natural growth pattern, encouraging them to become ingrown. Nail varnish makes checking your toenails difficult. You might not notice bleeding beneath a nail, for example. Keep nails free of nail varnish so that you can keep an eye on them. Pamper tired feet at bedtime with a mixture of peppermint and coconut oils, as Dance Magazine suggests, and they’ll feel refreshed by the morning. Of course, there’s only so much you can do for your feet at home or in the dance studio. If you’d like professional help to treat corns and calluses, combat ingrown toenails or relieve foot pain, for example, you can rely on our skilled London podiatry team. Our biomechanical assessments, which include hi-tech gait analysis, can be particularly helpful for anyone who loves to dance, as they enable us to identify and correct problems with foot function. Moreover, our prescription orthotics are designed to make your shoes as supportive as possible, helping you to dance to the very best of your abilities. For foot care for dancers from fully qualified podiatrists, please call Feet By Pody today on 0207 099 6657 or book an appointment online.